Now that the holidays have come and gone, there’s probably only one thing on your mind — New Year’s resolutions. If one of your goals is cleaning up your diet and incorporating more low-carb meals into your day, then this recipe is for you. Pressure cooking was the kitchen trend of 2017, and this year will be no different. Many of you might have gotten a great deal on an electric pressure cooker (I use Instant Pot. ), and this is the perfect way to test it out. If you don’t have a pressure cooker, you can easily adapt this according to what you do have at home. 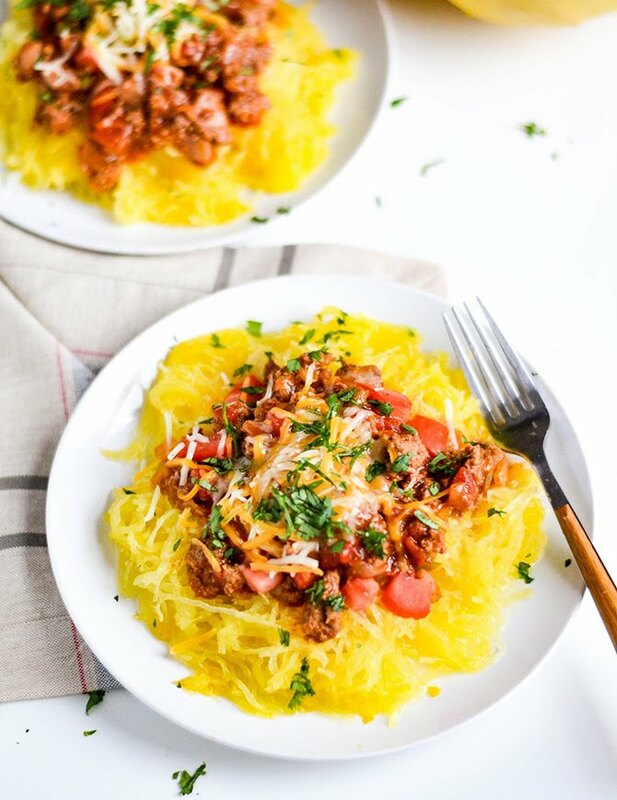 Try roasting the spaghetti squash at 400 degrees for 50 minutes, and preparing the sauce the same way you would in the pressure cooker, only in a saute pan on the stove. This meal will leave you satisfied without feeling the least bit deprived! 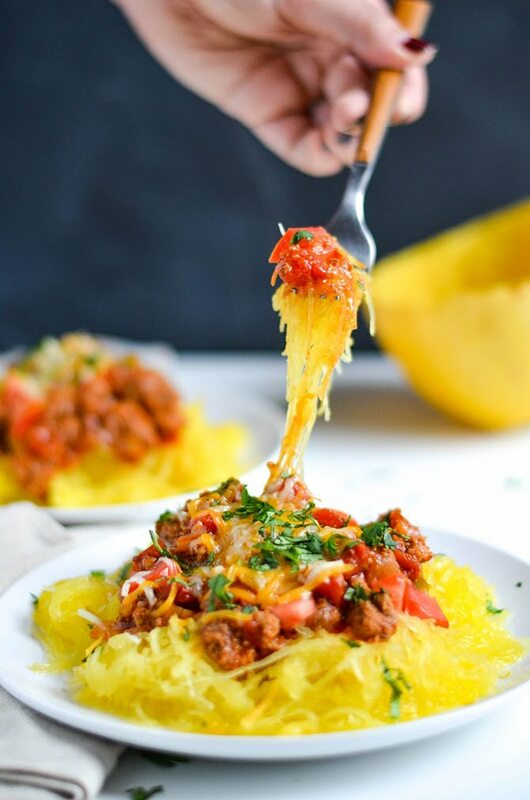 Cut the spaghetti squash in half, crosswise. A smaller paring knife works well to get through the thick skin. Scoop out the seeds in the center of the squash and discard everything, like you would a pumpkin. Place the squash halves on the steamer insert. I had one sitting up and one on its side because it wouldn’t fit otherwise. No biggie. Remove the lid and carefully remove the squash. Caution: there may be hot liquid collected in the hollows. Shred the squash with a fork and set aside. Remove the trivet from the Instant Pot and dispose of any residual cooking liquid. Add olive oil to the pot, and using the “Saute” function, allow the Instant Pot to come back up to temperature with the lid off. When the Instant Pot is ready, add ground meat and saute until browned until poultry is no longer pink. Add diced onion and taco seasoning, and continue to saute until onion is translucent and fragrant. Add diced tomatoes and chiles and tomato paste. 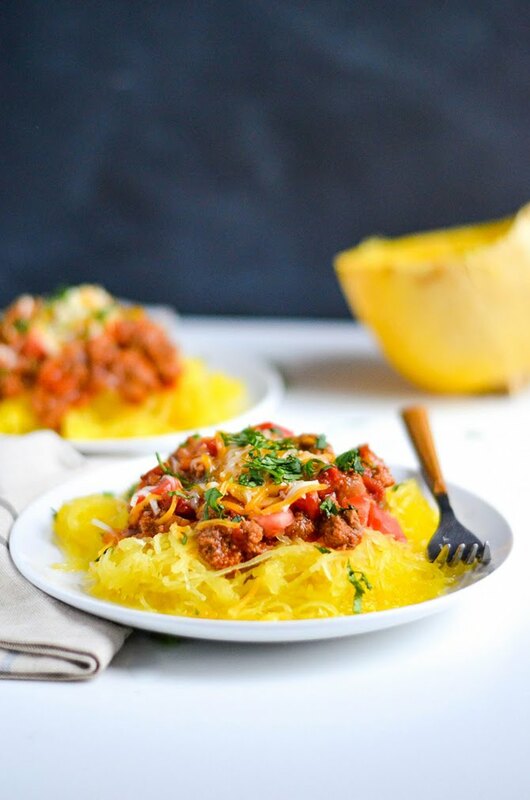 Stir until well combined, add spaghetti squash back into the pot, and simmer everything for 10 more minutes. Top with cheese and allow it to melt before serving. Serve with a sprinkle of fresh Roma tomatoes and cilantro. Find more recipes from Paige Rhodes here.